These three galaxy images from the AEGIS survey show a range of galaxy types: a disk-like spiral galaxy (top), a cloud-like elliptical galaxy (middle), and an irregular galaxy resulting from a galactic merger (bottom). Hubble Space Telescope images taken by the DEEP2 Team, UC Santa Cruz and UC Berkeley. The relation between a galaxy's mass and the orbital speed of its stars and gas is remarkably consistent over a wide range of galaxy morphologies and over billions of years of galaxy evolution, according to new results from a major survey of distant galaxies. The findings show that certain fundamental properties of galaxies have actually changed very little over the past 8 billion years (about half the age of the universe). "We think this trend reflects a regularity in the process that led to the formation of galaxies. 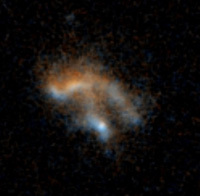 We are not sure where it comes from, but it is a major constraint on galaxy formation," said Sandra Faber, University Professor of astronomy and astrophysics at the University of California, Santa Cruz. Simply put, the more massive a galaxy is, the faster the stars and gas within it move. Susan Kassin, a postdoctoral researcher working with Faber at UCSC, described this relation by analyzing new data from ground-based and space-based telescopes for 544 distant galaxies with a range of morphologies. The analysis involved a new way of measuring the internal dynamics of galaxies proposed by Benjamin Weiner, now at the University of Arizona, when he was a postdoctoral researcher at UCSC. "By defining a new speed indicator, their analysis has managed to make sense out of very chaotic-looking objects," Faber said. "The galaxies almost magically fall into place." The findings are an extension of the Tully-Fisher relation, which was established for nearby spiral galaxies nearly 30 years ago, Kassin said. She is first author of a paper describing the new findings to be published in a forthcoming special issue of Astrophysical Journal Letters (ApJL) devoted to initial results from the All-wavelength Extended Groth strip International Survey (AEGIS). AEGIS is a collaborative effort involving nearly 100 scientists in half a dozen countries, including 10 instrument teams, to provide deep imaging and spectroscopy at multiple wavelengths over a large area of sky. Kassin's study relied primarily on data from the Hubble Space Telescope, the DEIMOS spectrograph at the W. M. Keck Observatory, and the Canada-France-Hawaii Telescope. Her findings, together with other results from the AEGIS survey reported in the same issue of ApJL, are giving researchers the first comprehensive view of the final stages of galaxy formation and how galaxies took on their modern, mature forms, Faber said. "We are now well on our way to seeing how galaxies evolved over the last half of the age of the universe," she said. "This work is not over, but the outlines of a theory are emerging." 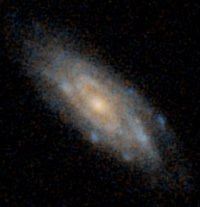 The Tully-Fisher relation correlates the luminosity of a spiral galaxy with its rotational speed: The brighter the galaxy, the faster it rotates. Recent refinements of the Tully-Fisher relation have replaced luminosity with stellar mass. Kassin and her collaborators have now extended it back in time to show that it has remained the same even as galaxies have evolved and changed over billions of years. The researchers looked at galaxies at redshifts ranging from 0.1 to 1.2, corresponding to "look-back" times of about 2 billion to nearly 8 billion years. In other words, the light now seen by telescopes left the galaxies 2 billion to 8 billion years ago, enabling astronomers to look back in time at earlier stages in the evolution of galaxies. "We are looking at galaxies in their adolescence," Kassin said. These distant galaxies tend to be more disordered than nearby galaxies. Disks, for example, tend to be less fully formed than in nearby spiral galaxies, Kassin said. In order to fully capture the internal motions of these galaxies, the researchers included a "dispersion component" to capture disordered motion in addition to the rotational motion of a disk. The result was a tight relation between stellar mass and internal velocities, and this relation applied to all galaxy morphologies, including the disordered "train-wrecks" left after galaxies collide and merge with each other. "Even train-wrecks fit this tight relation between the new speed indicator and the stellar mass of the galaxies, which is surprising. It indicates that there is a remarkable regularity to galaxies, irrespective of what they look like," Kassin said. By extending the Tully-Fisher relation to include other galaxy morphologies in addition to spiral galaxies, the new analysis seems to encompass another famous scaling law for galaxies, the Faber-Jackson relation, which correlates the luminosity of elliptical galaxies with a measure of their disordered motions. This is remarkable because ellipticals and spirals represent two very different categories of galaxies. Elliptical galaxies are "old, red, and dead," with old populations of stars and no active star formation, whereas spiral galaxies are characterized by active star formation and blue light from young, hot stars. "The Faber-Jackson relation is for red and dead galaxies that have finished star formation, and Tully-Fisher is for blue star-forming galaxies," said Faber, who codiscovered the Faber-Jackson relation in 1976. Spiral galaxies are dominated by a large, flat, rotating disk of stars and interstellar matter, whereas the orbits of stars in elliptical galaxies are randomly oriented. Kassin and her collaborators have, in effect, combined the Tully-Fisher and Faber-Jackson relations by measuring both ordered rotation and scrambled motion for all galaxy types. "We were truly surprised at how well the new speed indicator works," Faber said. According to Faber, the relation described in this study may reflect processes that began in the first fraction of a nanosecond after the Big Bang. "Galaxies began life as quantum fluctuations--tiny density fluctuations that created the seeds for the later coagulation of structure in the universe. When gravity took over, those seeds made galaxies, and we think that process is reflected in the Tully-Fisher relation," she said. Measurements of the internal kinematics of distant galaxies--the orbital velocities of their stars and gas--were essential to this study and required high-resolution spectra obtained by the DEIMOS spectrograph on the 10-meter Keck II Telescope. Equally important to the analysis were images of the galaxies obtained by the Hubble Space Telescope. The researchers also used photometric data from the 3.6-meter Canada-France-Hawaii Telescope to determine stellar masses. The DEIMOS spectra and Hubble images are the backbone of the AEGIS project, which was organized by the DEEP2 Survey team led by Marc Davis of UC Berkeley. 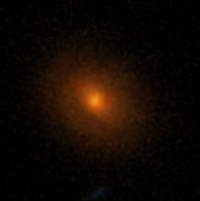 DEEP2 has used DEIMOS to obtain high-resolution spectra of 50,000 galaxies. AEGIS also includes data from many other ground-based and space-based telescopes, including the Spitzer Space Telescope, Chandra X-ray Observatory, the GALEX ultraviolet satellite, and the Very Large Array radio telescope. In addition to Kassin, Weiner, and Faber, the coauthors of the new paper are David Koo, professor of astronomy and astrophysics at UCSC; Jennifer Lotz of the National Optical Astronomical Observatories; Juerg Diemand, Justin Harker, A. J. Metevier, Andrew Phillips, Nicholas Konidaris, and Kai Noeske of UCSC; Kevin Bundy of the University of Toronto; Michael Cooper and Darren Croton of UC Berkeley; and Christopher Willmer of the University of Arizona. For more information about AEGIS, including images and preprints of the ApJL papers, visit the project web site. Funding for this research was provided by the National Science Foundation and NASA. Note to reporters: You may contact Faber at (831) 459-2944 or faber@ucolick.org and Kassin at (831) 459-3804 or kassin@ucolick.org.